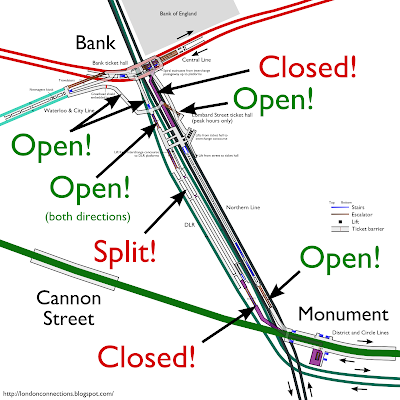 I made a visit to Bank-Monument on my way home and bring good news in diagram form (closed areas in purple - click to enlarge). Two of the three closed to scare you away passageways are back open, and in both directions - at least when I was there. With only the spiral staircase passageway closed, movement around the north end of the station is almost completely free, and the "no interchange at Bank and Monument" is even less true than ever. There is some bad news for passengers arriving on the DLR. The gates across to the departures platform at Bank were closed, making the stairs up to the Northern Line and so the route to Monument inaccessible. The only way out is to take an escalator up to the interchange hall, from where you can take a short flight of stairs down to the Northern Line, but to get to Monument you then have to walk the entire length of the platforms. I have a feeling this was just a temporary measure due to rush hour crowding on the departures platform, however. I was the guy who made the ridiculously long rant on the last post. I just came back to tell you how happy I was when I got to bank this evening to find my favourite walkway open! (I may have mentioned I only go on the tube Monday and Friday). Me: "I thought this was going to be closed? How long is this open for?" Him: *standing beneath two large central line sign* "CENTRAL LINE THIS WAY I don't know, it's being tested CENTRAL LINE THIS WAY"
I didn't want to distract him from his very busy job of stating the obvious, so on my way I went, content that I didn't have to pay £3, walk half a week around Bank, and got to my train on time. I guess we'll see what happens on Monday. I do need to get from Oval to Bethnal Green (and back) tomorrow. It's me again, FWIW it was open still yesterday (Monday)... Lets hope it stays open!